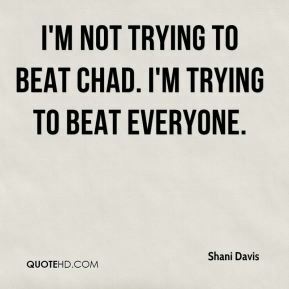 I'm not trying to beat Chad. I'm trying to beat everyone. I respect her and, honestly, if she wasn't the way she was, I wouldn't be able to handle some of the things that I go through with the sport. This is where you do it. This is once every four years. 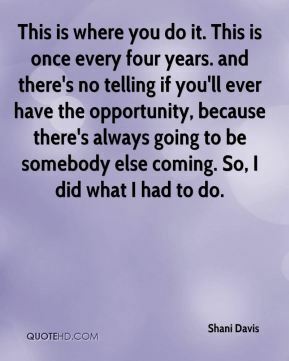 and there's no telling if you'll ever have the opportunity, because there's always going to be somebody else coming. So, I did what I had to do. The Dutch fans are really passionate about speed skating. They bring a lot of energy and atmosphere to our sport. I'm trying not to get too emotional because I have more events. I'll be emotional in the closing ceremony, but I've got a job to do. 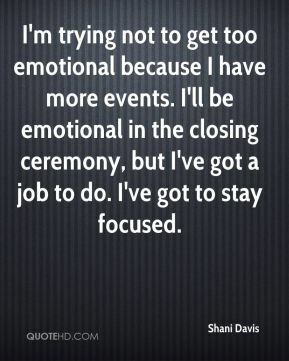 I've got to stay focused. You've got to be tough. 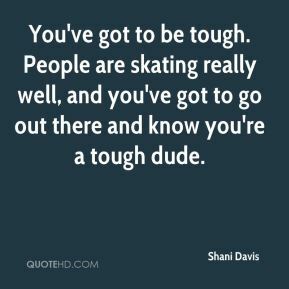 People are skating really well, and you've got to go out there and know you're a tough dude. Because it's an improvement. As long as I'm improving, I'm pretty happy if it's a world record or a rink record. 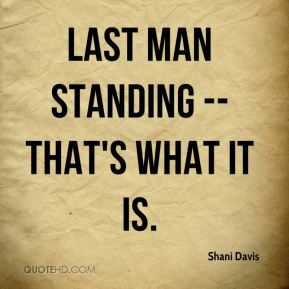 Last man standing -- that's what it is. I knew what I was getting myself into before I started this. I knew it was going to be fierce competition. 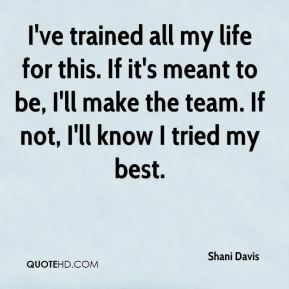 If it's meant to be, I'll make the team. If not, I tried my best. The competition is not over. Lord knows what can happen. 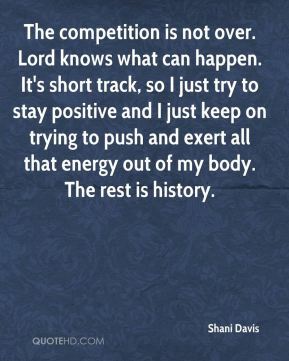 It's short track, so I just try to stay positive and I just keep on trying to push and exert all that energy out of my body. The rest is history. It's tough, but I knew what I was getting myself into before I took the challenge. 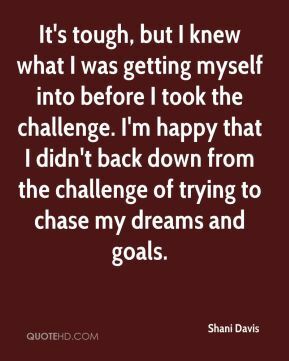 I'm happy that I didn't back down from the challenge of trying to chase my dreams and goals. I'm pretty satisfied. 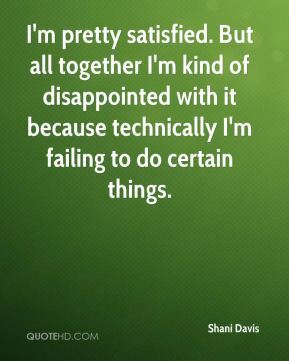 But all together I'm kind of disappointed with it because technically I'm failing to do certain things. I've trained all my life for this. 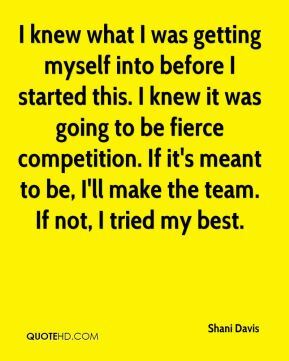 If it's meant to be, I'll make the team. If not, I'll know I tried my best. I can be really fast, but other people are in the race. 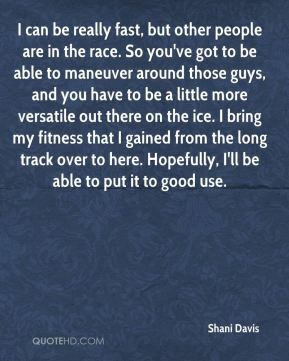 So you've got to be able to maneuver around those guys, and you have to be a little more versatile out there on the ice. I bring my fitness that I gained from the long track over to here. Hopefully, I'll be able to put it to good use. I guess it was not meant for me to do it. I tried my best. 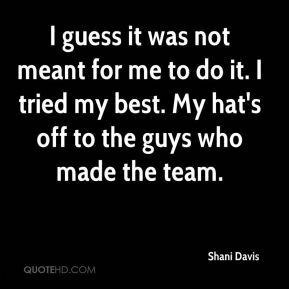 My hat's off to the guys who made the team. 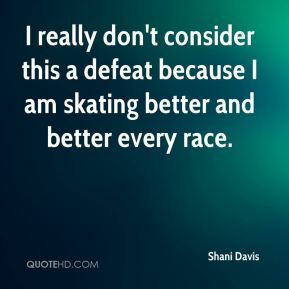 I really don't consider this a defeat because I am skating better and better every race. 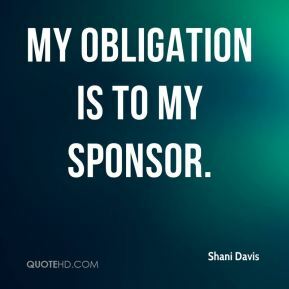 My obligation is to my sponsor. We're a very competitive country. We want the best of the best. 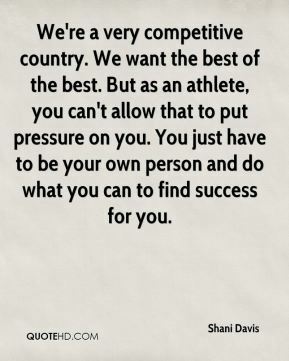 But as an athlete, you can't allow that to put pressure on you. You just have to be your own person and do what you can to find success for you. No one loves you more than your mother. It's like on the Discovery Channel where you see a bald eagle do everything it can to protect its young. 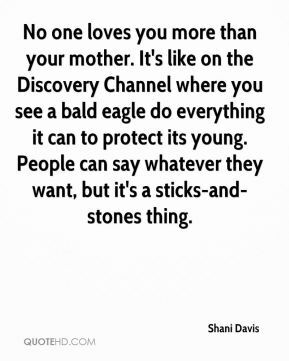 People can say whatever they want, but it's a sticks-and-stones thing. I don't want to be a celebrity athlete. When you are, there's this pressure on you. 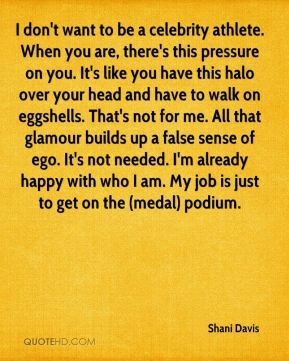 It's like you have this halo over your head and have to walk on eggshells. That's not for me. All that glamour builds up a false sense of ego. It's not needed. I'm already happy with who I am. My job is just to get on the (medal) podium. 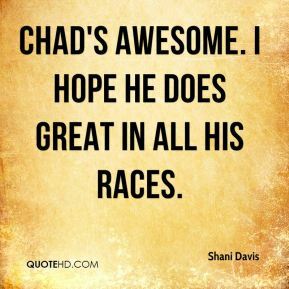 Chad's awesome. I hope he does great in all his races. To me, personally, it doesn't matter what color I am. 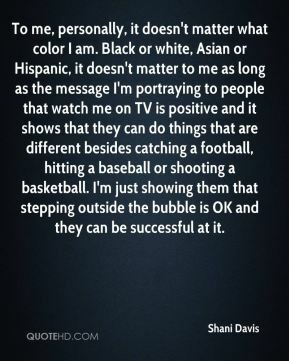 Black or white, Asian or Hispanic, it doesn't matter to me as long as the message I'm portraying to people that watch me on TV is positive and it shows that they can do things that are different besides catching a football, hitting a baseball or shooting a basketball. I'm just showing them that stepping outside the bubble is OK and they can be successful at it. 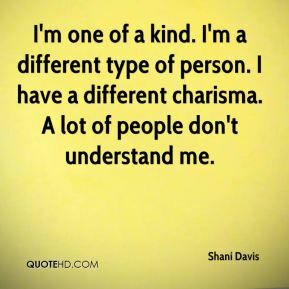 If what I do creates a common interest among certain people to try something different, great. Whatever comes from what I do is a bonus. But I'm just trying to win. 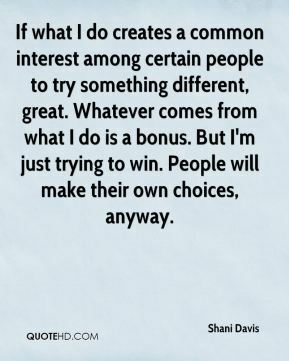 People will make their own choices, anyway. 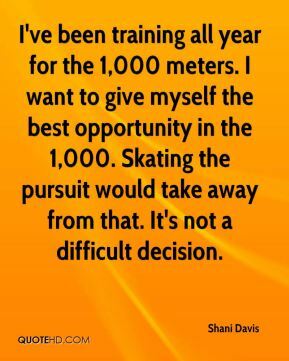 I've been training all year for the 1,000 meters. I want to give myself the best opportunity in the 1,000. Skating the pursuit would take away from that. It's not a difficult decision.